Used rpi2 for weeks on openelec and osmc, and never had this problem. On XBian problem arised after completely fresh install. After I turn off tv, in few seconds it will be turned back on. By the way...i have also a Onkyo SR608 .... a Problem with the Onkyo Receiver ??? 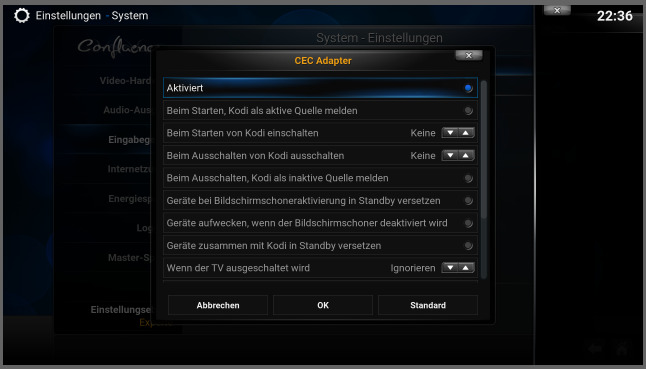 Also if i set something "not standard" in the advanched CEC Settings, after reboot CEC is broken. If there are no solutions, try our github issues. I have almost the same issue the CEC starts the TV every 24h at the exact time of the last reboot. I have no receiver attached just the Raspberry and the TV, same issue with both my old and new Samsung TV. LG has the same issue with their CEC dependent standard Simplink. Only way i found to bypass the issue and still have standard CEC was to disable Simplink on the TV... Now not all manufacturers allow this (came across some Samsungs that did not have an option to disable their Anynet software and still keep CEC alive). I think i wrote a thread about this here... anyway if your TV allows it, just disable the manufacturer "enhanced" CEC based functions and it should stop this. I have the same problem. I tried with a fresh instalation and the problem still there. It happened only with the xbian version for rpi2. If I connect rpi model b cec works perfectly and don't wake up tv. I still experience this with the June 10 build plus updates on a Cubox-i4Pro and an LG Smart TV. I used the same television with the same Cubox and wireless keyboard with OpenElec 6 and 5 without experiencing any problems with CEC. The Cubox would only turn the TV on when I actually moved the mouse/touchpad or hit a key on the keyboard. With this build of Xbian, I can turn the wireless keyboard completely off and the TV still comes on within a minute of turning it off. Of course I can turn of CEC, but it would be nice if this would work correctly.